There are amazon affiliate links posted here which helps support this amazing blog! Thank you! Understanding and practicing perspective in your drawings and paintings is an important fundamental in your art practice. If you can grasp this concept your art will reach new heights in technique and concepts. Every piece of art will use perspective to one degree or another. How they use it varies from one artist to the next. When I think about perspective drawings or paintings, the first person that comes to mind would be architect, Fillipo Brunelleschi & artist, Masaccio. The linear perspective was created by use of a vanishing point to which all lines converged at eye level. Soon this caught on and became standard. Before this concept came to light, much of the Medieval or ancient art doesn't possess this attribute. Masaccio was the first painter of the early Renaissance to demonstrate efficacy over this new concept. But as a fan of all things surreal I can't help but think about the more interesting concepts in the use of perspective such as with M.C. Escher, or Salvdor Dali as two examples. I hope these examples give you a better sense about what perspective really means and how we can use it to create more accurate and interesting drawings and paintings. Place a dot anywhere on the page. I recommend you don't put it in the center for your first exercise merely so that you can see how the lines contour toward the vanishing point. Draw a horizon line going across your vanishing point. Use a ruler to draw lines that extend from your vanishing point. You don't necessarily have to measure those lines. But, of course, you can if you are looking for some serious accuracy. You could start with any shape you would like. But I started with a sphere. A sphere will not become more narrow as it recedes toward the vanishing point. But the sphere may become much smaller. If you don't know much about drawing spheres, here is my video on how to draw a sphere. Try drawing a couple of spheres in different locations making them smaller as they make their way toward the vanishing point. Now draw a cube. If you still need help drawing a cube, here is a video on how to draw a cube. Pick a space between your vanishing point lines to draw the stem of your Y shape for the beginning of your cube. Then use the extending line as a guide for the right side of your Y. Extend the left side of the Y to the next vanishing point line. You can finish your cube shape in between these two vanishing point lines. 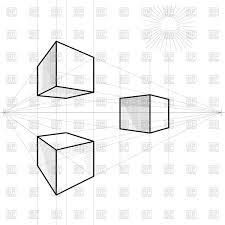 You'll notice how the cube becomes more shallow as it recedes into the vanishing point. Try to draw a few more cubes with different heights and lengths. Try for a cone. Here is another video if you want to know how to draw a cone. The main things to notice when drawing a cone is that the cone part of the shape will change size depending on where it's placed on the landscape, and the base will become more ellipse like as it moves closer to the horizon, or vanishing point. Try drawing a few in different places to notice how much the base shape changes from a circle to an ellipse as it moves toward the vanishing point. And this is the same for when you draw a cylinder. The top and the base of the cylinder will become more ellipse like as it moves toward the vanishing point. Here is a video on how to draw a cylinder. And that's basically it! Good job guys! I hope this helped you think more about how perspective works in a drawing. Keep practicing this and let me know how it's going in the comments below. Check back next Wednesday where I'll be posting a video and blog about how to draw a one point perspective in a real setting.